In the Hawaiian language petroglyphs are called ki‘i pōhaku (ki‘i means “image,” and pōhaku means “stone”). 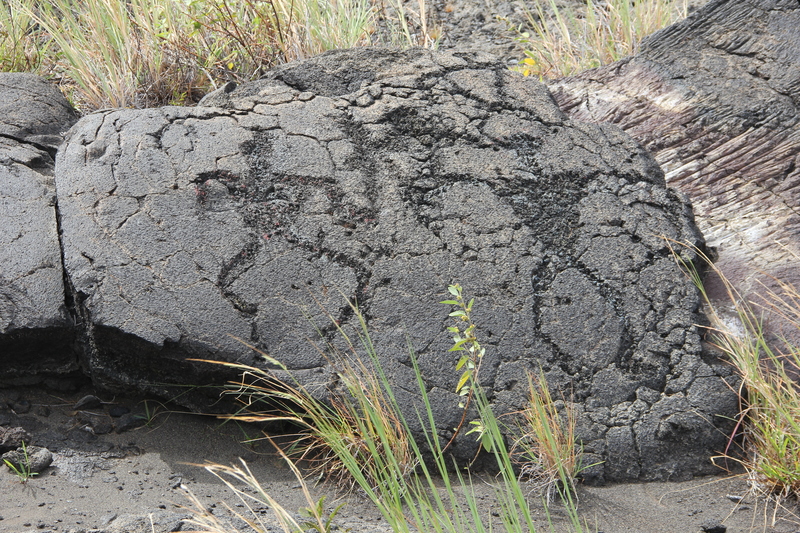 Most petroglyphs in Hawaii are found in “fields” on broad expanses of smooth pahoehoe basalt which facilitated both carving the images as well as gatherings of celebrants in sacred rituals. Many small scattered groups and lone carvings are known throughout the Hawaiian Islands but more often they are found in specific locations. With Hawai‘i Island’s large landmass—most of it conducive to rock carving—one wonders why so much of it is petroglyph-free while some areas are densely covered? Hawaiian natives are very sensitive to places with high energy or areas with “power spots,” containing special mana (power)…this is where the highest concentration of ki‘i pōhaku are found although the full reasons for their location and creation remain a mystery. Pu’u Loa, translated from Hawaiian as the “long hill” or “Hill-(of)-long-(life)”, is a place considered sacred to the people of Hawai`i, and those of Kalapana district in particular. In geologic terms the lava field is relatively new, dated between AD 1200-1450. Puu Loa was interpreted to mean ‘long life’ by the Hawaiians, so for countless generations, soon after giving birth, parents would place their baby’s navel cord in a simple circle petroglyph for the overnight ritual of the piko (umbilical cord) ceremony. This was done to impart to the child the mana of the sacred site and ensure a long life. Pu’u Loa, on the island of Hawaii, is the largest petroglyph field in all of Polynesia. The archaeological site, part of Hawaii Volcanoes National Park, contains over 23,000 images; human representations known as anthropomorphs, canoe sails, circles, geometric as well as cryptic designs and motifs containing cupules or holes which make up 84% of the total. 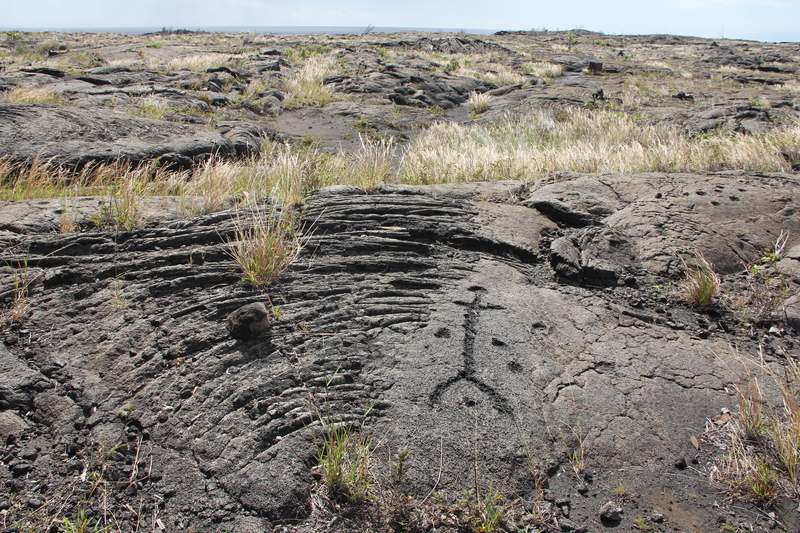 Petroglyphs in the Hawaiian Islands are divided into three categories: descriptive, symbolic, and cryptic. Descriptive petroglyphs may be recognizable subjects, including anthropomorphic images or man-made objects, such as canoes, paddles, sails, and fishhooks, as well as the circles and dots associated with the piko (umbilical cord) ceremony. Symbolic petroglyphs are less recognizable, often consisting of forms carved in an unnatural manner, yet obviously purposefully created, and thus meaningful to the carver. Early expeditions to the Hawaiian Islands produced reports of native men and women with tattoo markings, and these may have been related to the symbols in the petroglyphs. Some petroglyphs might represent the specific mark of an individual, like a signature. Cryptic petroglyphs are mysterious images that are very different than the descriptive and symbolic petroglyphs. Cryptic petroglyphs are by definition of uncertain meaning and many theories and interpretations have been offered over the years to explain these petroglyphs, yet much uncertainty remains. Some have suggested that certain cryptic or symbolic petroglyphs may be created in such a way as to have secret or double meanings, similar to the kaona (hidden meanings) often used in Hawaiian chants. Among the thousands of petroglyphs found on the vast, barren lava fields of the island of Hawai‘i, what we do know, through both scientific carbon dating and distinctive carving styles, is the progression of more and more sophisticated art forms. The earliest being linear stick-man drawings, which then moved to a brief period of block-like, wide-bodied forms. Both of these styles are found used by ancient cultures worldwide. The most recent pre-contact drawings use triangular anthropomorphic forms unique to the Hawaiian k‘i‘i pōhaku. The Pu’u Loa Petroglyphs, located off the Chain of Craters Road in Hawai’i Volcanoes National Park, are worth spending some extra time on a trip into the park. It is a short hike from the road to the petroglyphs. This trail is marked on the Park map as well as indicated by a sign near the end of Chain of Craters Road. You can also see more of Pu’u Loa and Hawai’i Volcanoes National Park by searching Google Earth. This entry was posted in Art, environment, history, the hungry brain and tagged environment, Hawaii, hiking, history, lava, preservation. Bookmark the permalink. Thanks for giving me another reason for me to long to visit Hawaii again! sending Aloha to you Genie. Thanks for sharing this interesting information. I’ve just put the petroglyphs on my bucket list of travel destinations. I’m interested in the idea of a sacred place or a ‘thin’ place. I imagine a place acquires a sense of the holy as it is treated as holy over years, but there must have been something about it to begin with that people would start to make their pilgrimages and rituals there. I wonder why that should be. It’s fascinating – thanks for posting about it. There are places on the Earth that are natural ‘power’ spots and have much ‘mana’. They exist and have existed long before mankind performed his rituals there. Such things make me wonder whether, if indeed there is lore we have lost, we may one day regain it. There is no question that the knowledge of the ancients has been mostly lost. One of the reasons I visit historical sites is hoping to gain some insight (and it usually makes for a good hike).